Leg and foot wounds have become a huge problem in the United States. Fortunately, there are thousands of Wound Care Centers to help with the day to day care of these painful and potentially dangerous wounds. Wound care centers are usually affiliated with hospitals and function as one of many resources that a patients with wounds has at their disposal in an effort to keep their wounds from progressing to where amputation may be the only choice left to salvage the limb. Unfortunately, in many of these wound care centers an underlying cause for why many of these non-healing wounds don't heal in a timely manner is often overlooked: circulation to the leg or foot. This can be either on the arterial side (Delivering oxygen and nutrients necessary to heal the affected area) or on the venous sid​e, (Removing toxins and fluid from the affected area). Research has shown that about 70% of people who seek care at Wound Care Centers have an underlying circulation issue. Unfortunately, the current practice in most wound care centers is that this circulatory problem is not diagnosed or considered until after months of futile debridement and dressing changes have failed to achieve long term healing. In an effort to best treat non-healing leg wounds it is critical, therefore, for patients to have their circulation evaluated by a Vascular Surgeon. This is even more important in patients over the age of 50, if there has EVER been a history of smoking, diabetes, or hypertension. Finally, this evaluation must be done at the very start of a wound care patients treatment and not be put off until after debridement and other topical approaches have failed. If you or a loved one is currently being seen at a wound care center for non-healing leg wound it is vital that you insist upon getting a vascular ultrasound study if it has not already been done. Testing for circulation is a non-invasive process and can be done, in most cases, in under an hour. Testing is pain free and does not involve the use of any drugs and or anesthesia. Using simple sound waves a Registered Vascular Ultrasonographer can easily scan for circulatory deficiencies and provide your physician with the critical information they need to develop a plan for how to best approach healing your wounds. Diabetic Wounds: If you have diabetes, you may be prone to foot ulcers since you may not have protective sensation on your feet. Causes of foot ulcers include excessive pressure or rubbing against the skin that may result from wearing ill-fitting shoes or walking barefoot. Arterial Wounds: Complete or partial arterial blockage can lead to ulcers. If you have arterial disease, you may have tests to measure blood flow or to locate a blockage in your arteries. Venous Wounds: These ulcers are usually a symptom of venous disease, where the veins in your legs are compromised, causing blood to build up. Typical venous ulcers appear near the ankle and are often painful. Additional information on non healing foot and leg wounds can be found by reading one of our many blog posts. Click on one of the links below to learn how the Vascular Surgeons at South Bay Vascular can help promote wound healing and to prevent amputations that may result from non-healing leg wounds. South Bay Vascular Center and Vein Institute physicians are recognized as the premiere wound care doctors in San Jose, Silicon Valley and all of Northern California. Recognized as one of the leading wound care physicians in the country, Dr. Kokinos currently serves as the medical director at both the Verity/O'Connor Wound Care Center in San Jose and St Louise Hospital Wound Care Center in Morgan Hill, CA. While podiatrists have always been the traditional starting point for the evaluation of and treatment of non-healing leg wounds, it is only the Vascular Surgeon who is fellowship trained to be able to evaluate and to treat the underlying cause of most non-healing wounds: poor circulation. Unfortunately, many times skin supplements, hyperbaric chambers and wound debridement are the standard treatment modalities for treating non-healing wounds without consideration of the underlying cause of poor circulation. If you or anyone you know suffers from long term non-healing ankle, foot or leg wounds, South Bay Vascular Center physicians are the leading wound care experts in San Jose and the South Bay and can evaluate the possibility of undergoing a revascularization procedure to address the root cause of this poor circulation. Vein problems cause most of the ulcers on the legs treated in wound care centers. These wounds are called “venous leg ulcers”, because they are located in the middle or lower part of the leg, usually above the ankle. These ulcers may be quite large (5-10 cm diameter) and may be “ugly” in appearance, but they are usually not painful. If there is associated pain, the pain is frequently relieved by elevation of the extremity. The skin around these ulcers may be brownish in color and may be firm to touch (not soft and supple), for many years before the ulcer begins. A common cause of leg ulcers is reflux (abnormal blood flow) in the veins of the leg, specifically the saphenous vein. This problem can be treated permanently by the physicians at South Bay Vascular Center & Vein Institute with an out-patient procedure done in the office. 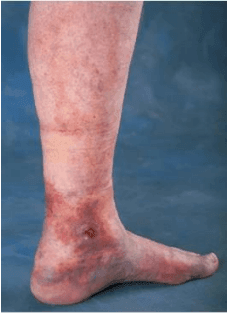 Otherwise, venous leg ulcers tend to recur over time, especially if an appropriate treatment regimen with compression hose has not been followed. With venous leg ulcers, the risk of limb loss is low. Arterial ulcers are usually very painful. They are most often located in the foot or toes, i.e. further from the blood flow pump (the heart). Pain is the primary complaint for these patients, especially pain at night if their foot is not kept below the heart. In fact, many patients tell us they sleep with the foot hanging off the bed, to relieve their pain. The wound itself may be small (1-2 cm diameter), and is usually dry. For example, it may be just the tip of a toe. These wounds do not often look as “ugly” as a venous leg ulcer, because there is not enough blood flow to make pus or drainage. The skin around the wound is sometimes red, tender, and swollen, because bacteria can get though the skin and invade the surrounding tissues. This problem needs urgent treatment, and the risk of limb loss is high. Diabetes patients also frequently get ulcers and wounds of the foot and toes, but that is primarily because of poor sensation (numbness) of the feet. 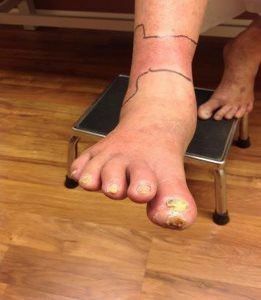 The technical term for this numbness is “peripheral neuropathy.” Many of these patients also have arterial problems, with resultant poor arterial blood flow. This group of patients is at especially high risk of limb loss. South Bay Vascular Center and Vein Institute is recognized as the leading amputation prevention center in San Jose, Silicon Valley and the entire San Francisco Bay Area. Call today if you or anyone you know suffers from non healing leg wounds, diabetic ulcers or any other circulatory issue.